With identity theft, cybercrime, and digital file sharing proliferating in today's wired world, providing safe and accurate information transfers has become a paramount concern. The issues and problems raised in this endeavor are encompassed within three disciplines: cryptography, information theory, and error-correction. As technology continues to develop, these fields have converged at a practical level, increasing the need for a unified treatment of these three cornerstones of the information age. Stressing the interconnections of the disciplines, Cryptography, Information Theory, and Error-Correction offers a complete, yet accessible account of the technologies shaping the 21st century. This book contains the most up-to-date, detailed, and balanced treatment available on these subjects. The authors draw on their experience both in the classroom and in industry, giving the book's material and presentation a unique real-world orientation. 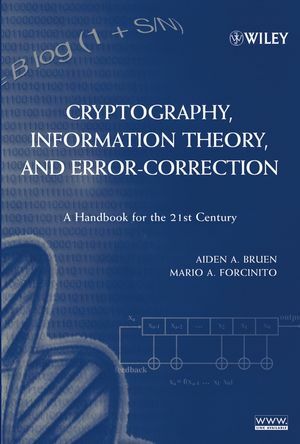 With its reader-friendly style and interdisciplinary emphasis, Cryptography, Information Theory, and Error-Correction serves as both an admirable teaching text and a tool for self-learning. The chapter structure allows for anyone with a high school mathematics education to gain a strong conceptual understanding, and provides higher-level students with more mathematically advanced topics. The authors clearly map out paths through the book for readers of all levels to maximize their learning. Cryptography, Information Theory, and Error-Correction is an excellent in-depth text for both graduate and undergraduate students of mathematics, computer science, and engineering. It is also an authoritative overview for IT professionals, statisticians, mathematicians, computer scientists, electrical engineers, entrepreneurs, and the generally curious. AIDEN A. BRUEN, PHD, is a Professor of Mathematics and Statistics at the University of Calgary in Calgary, Alberta, Canada. He has over 100 published articles in refereed journals and has served for many years on the Editorial Board of Designs, Codes and Cryptography. His research interests include error-correcting codes, number theory, algebraic geometry, algebra finite geometries, information theory, and cryptography. MARIO A. FORCINITO, PHD, is a professional engineer with over ten years' experience as an industrial consultant. He is President of SUR Consultants in Engineering Science Inc., a member of the IEEE Computer Society, and has published extensively in peer-reviewed journals. Dr. Forcinito has experience lecturing on cryptography and numerical methods at several technical meetings. 1. History and Claude E. Shannon. 1.2 Brief Biography of Claude E. Shannon. 2. Classical Ciphers and Their Cryptanalysis. 2.6 The Enigma Machine and its Mathematics. 2.8 Breaking the Vigenère Cipher. 3. RSA and Key Searches. 3.3 Public-key Cryptography and RSA on a Calculator. 3.4 The General RSA Algorithm. 3.5 Public Key Versus Symmetric Key. 3.6 Attacks, Security of DES. 4. The Fundamentals of Modern Cryptography. 4.2 Block Ciphers, Shannon’s Confusion and Diffusion. 4.3 Perfect Secrecy, Stream Ciphers, One-Time Pad. 4.5 Message Integrity Using Symmetric Cryptography. 4.8 The Diffie-Hellman Key Exchange. 4.10 Key Management and Kerberos. 5. DES, AES and Operating Modes. 5.1 The Data Encryption Standard Code. 5.4 The Advanced Encryption Standard Code. 6. Elliptic Curve Cryptography (ECC). 6.1 Abelian Integrals, Fields, Groups. 6.4 The Hasse Theorem, and an Example. 6.6 The Group Law on Elliptic Curves. 6.7 Key Exchange Using Elliptic Curves. 6.8 Elliptic Curves Mod n.
6.11 More Geometry of Cubic Curves. 6.12 Cubic Curves and Arcs. 6.14 Fermat’s Last Theorem, Elliptic Curves. Gerhard Frey. 7. General and Mathematical Attacks in Cryptography. 7.11 Birthday Attack on Digital Signatures. 7.12 Birthday Attack on the Discrete Log-Problem. 7.14 Attacks on RSA Using Low-Exponents. 7.17 Implementation Errors and Unforeseen States. 8. Topical Issues in Cryptography and Communications. 9. Information Theory and Its Applications. 9.4 Practical Applications of Information Theory. 9.5 Information Theory and Physics. 9.7 Number Bases, Erdos and the Hand of God. 9.8 Weighing Problems and Your MBA. 9.9 Shannon Bits, the Big Picture. 10. Random Variables and Entropy. 10.7 Law of Large Numbers. 10.8 Joint and Conditional Entropy. 10.10 Calculation of Mutual Information. 10.11 Mutual Information and Channels. 10.12 The Entropy of X + Y. 10.13 Subadditivity of the Function x log x. 11. Source Coding, Data Compression, Redundancy. 11.3 Block Coding, The Oracle, 20 Questions. 11.6 Optimality of Huffman Encoding. 11.7 Data Compression, Lempel-Ziv Coding, Redundancy. 12. Channels, Capacity, the Fundamental Theorem. 12.3 New Channels from Old, Cascades. 12.4 Input Probability, Channel Capacity. 12.5 Capacity for General Binary Channels, Entropy. 12.7 Improving Reliability of a Binary Symmetric Channel. 12.8 Error Correction, Error Reduction, Good Redundancy. 12.9 The Fundamental Theorem of Information Theory. 12.10 Summary, the Big Picture. 13. Signals, Sampling, S/N Ratio, Coding Gain. 13.1 Continuous Signals, Shannon’s Sampling Theorem. 13.2 The Band-limited Capacity Theorem. 14. Ergodic and Markov Sources, Language Entropy. 14.1 General and Stationary Sources. 14.3 Markov Chains and Markov Sources. 14.4 Irreducible Markov Sources, Adjoint Source. 14.5 Markov Chains, Cascades, the Data Processing Theorem. 14.6 The Redundancy of Languages. 15. Perfect Secrecy: The New Paradigm. 15.2 Perfect Secrecy and Equiprobable Keys. 15.3 Perfect Secrecy and Latin Squares. 15.4 The Abstract Approach to Perfect Secrecy. 15.5 Cryptography, Information Theory, Shannon. 16. Linear Feedback Shift Registers (LFSR). 16.2 Construction of Feedback Shift Registers. 16.4 Maximal Periods and Pseudo Random Sequences. 16.5 Determining the Output From 2m Bits. 16.6 The Tap Polynomial and the Period. 17.3 Structure and Purpose of DNA. 17.4 The Double Helix, Replication. 17.8 Entropy and Compression in Genetics. 17.9 Channel Capacity of the Genetic Code. 18. Error-Correction, Hadamard, and Bruen-Ott. 18.2 Error Detection, Error Correction. 18.3 A Formula for Correction and Detection. 18.5 Mariner, Hadamard and Reed-Muller. 18.8 A Problem of Lander, the Bruen-Ott Theorem. 18.9 The Main Coding Theory Problem, Bounds. 19. Finite Fields, Linear Algebra, and Number Theory. 19.2 A Little Linear Algebra. 19.4 Primitive Roots for Primes and Diffie-Hellman. 19.5 The Extended Euclidean Algorithm. 19.6 Proof that the RSA Algorithm Works. 20. Introduction to Linear Codes. 20.2 Details of Linear Codes. 20.3 Parity Checks, the Syndrome, Weights. 20.5 Perfect Codes, Errors and the BSC. 20.6 Generalizations of Binary Hamming Codes. 20.7 The Football Pools Problem, Extended Hamming Codes. 21. Linear Cyclic Codes and Shift Registers. 21.2 Generators for Cyclic Codes. 21.3 The Dual Code and The Two Methods. 21.4 Linear Feedback Shift Registers and Codes. 21.5 Finding the Period of a LFSR. 22. Reed Solomon and MDS Codes, Bruen-Thas-Blockhuis. 22.1 Cyclic Linear Codes and the Vandermonde Matrix. 22.4 Reed-Solomon Codes and the Fourier Transform Approach. 22.5 Correcting Burst Errors, Interleaving. 22.6 Decoding Reed-Solomon, Ramanujan, Berlekamp-Massey. 22.7 An Algorithm and an Example. 22.8 MDS Codes and a Solution of the Fifty Year-old Problem. 23. MDS Codes, Secret Sharing, Invariant Theory. 23.2 The Case k=2, Bruck Nets. 23.4 MDS Codes and Secret Sharing Schemes. 23.5 MacWilliams Identities, Invariant Theory. 23.6 Codes, Planes, Blocking Sets. 23.7 Binary Linear Codes of Minimum Distance 4. 24. Key Reconciliation, Linear Codes, New Algorithms. 24.3 The Secret Key and The Reconciliation Algorithm. 24.4 Equality of Remnant Keys: The Halting Criterion. 24.5 Convergence of Keys: The Checking Hash Function. 24.6 Convergence and Length of Keys. 24.8 Some Details on the Random Permutation. 24.9 The Case where Eve has Non-zero Initial Information. 24.10 Hash, Functions using Block Designs.